Can my dog’s behaviour be affected by me? When people have a problem with their dog, they tend to see it as a problem with their dog. But it takes two to tango! And if your dog is presenting “problem behaviour” you can bet your boots that you have something to do with it. Yes - it may start with your dog, but it quickly becomes enmeshed with what you do. And sometimes we can make things worse - when we really, really want to make things better. An interesting study was published recently, linking the owner’s hormone levels with the hormone levels of the dog in their charge. We’re talking here about Cortisol, known as the “stress hormone” because it’s released during stress. It operates the same way in the dog as in us. The study, which you can see here, goes into great scientific detail about the links between our anxiety and the anxiety of our dog. Suffice it to say, that if you’re worried, your dog will be worried. And if your dog is worried, then you will be worried. An unholy vicious circle that causes poor behaviour to escalate. That is, until you know how to handle the situations which have up to now been stressful for you. Once you know what to do, and how to lessen the stress for your dog, your own stress levels will automatically fall. This bond between dogs and humans is what enables the astonishing feats which we are beginning to take for granted - an assistance dog being able to predict an impending attack in an owner who suffers from certain conditions, for example. Seizure Alert Dogs help many people manage their epilepsy. And there are other diseases which cause dangerous imbalances which these dogs can anticipate, giving their owner the time to find a safe place and take their medication. So if this link is so strong between us and our pooches, it brings into question the idea of having someone else train your troublesome dog for you. The best trainers (by that I mean enlightened force-free trainers who understand the science of Learning Theory and what actually makes beings tick) spend a lot of time training the owner to view their dog differently. Some of my private training sessions, for instance, focus almost entirely on the owner’s state of mind. Any training I do with the dog is there to help the owner understand how to relate to their dog, rather than me training the dog for them. And this calls into question the popularity of residential training for dogs - sending the problem dog away to a trainer who will fix the dog for you. It may be effective insofar as the dog can be taught new ways to respond to what he previously found overstimulating or frightening. But if handed back to an owner who has not had the benefit of this training - for themselves, not for the dog - there is not going to be very much change. A quick handover session is not going to be enough to fundamentally change how a person views their dog - or their dog’s supposed “problem behaviour”. It’s no use doing magical training with the dog if the person the dog has to live with has not changed. Learning to cope with a dog’s “problem behaviour” - often the dog’s inability to function freely in our world, manifested as reactivity or anxiety or aggression - needs a fundamental shift in the owner’s perception. If you don’t understand why your dog is kicking off at the sight of an advancing person, or a piece of litter on the ground, you will be caught unprepared and unable to change the situation. That’s enough to make anyone anxious! In society, our response to someone misbehaving is to put more controls on them. Restrict them, restrain them, prevent them. And so when confronted with a problem with our dog, we can have a knee-jerk reaction and follow the same process. But more control is not the answer! I don’t want to have to control my dog - I want my dog to control herself. 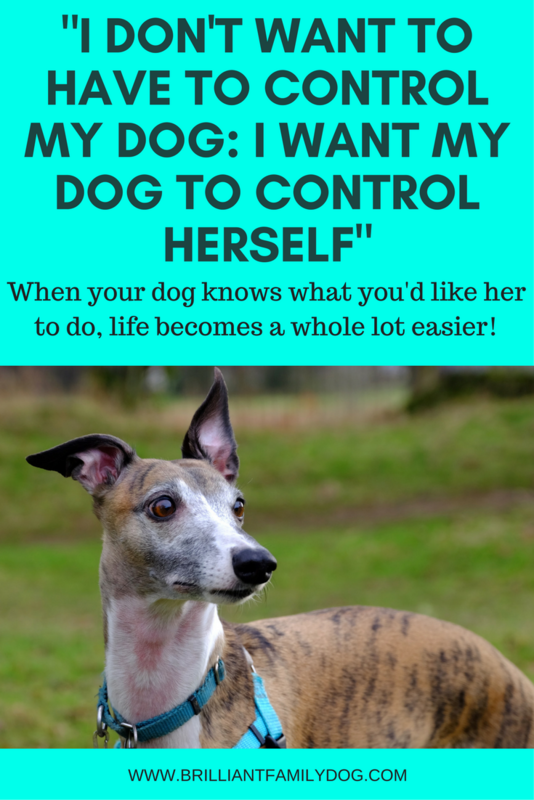 Teaching your dog to control herself is going to require understanding from you - understanding what the problem is exactly (it may not be what you think it is - dogs are not humans) and why your dog is doing what she’s doing. Only then are you in a position to effect a change. Most of us have busy lives. We got our pet as a companion to make our days more enjoyable, not to make them harder! So perhaps the easiest way for you to make the changes you may feel are necessary, is to find yourself a first-class, well-qualified, force-free trainer who will be able to teach the both of you. You’ll need to do some research to find someone reliable - but they are there. You’ll find a list at the end of this post which will get you going in the right direction. Avoid anything that talks of Pack Theory, Dominance, or (the worst deception of the lot) “Balanced training”, which effectively means that they reward with one hand and punish with the other. And if you’re naturally an anxious person - think how learning how to alleviate your dog’s anxiety will help you to relax and feel better able to cope. Now your dog really will be fulfilling the role of companion and helper! You can both forge forward together. You can start off looking for help with a free email course here, and you’ll find some very accessible books (no science or jargon!) right here. As ever, add your thoughts in the Comments below, or contact me direct here. Is my dog a reflection of me?